Well, it’s been a long day and this mini Dachshund remains confused on the topic of the little humans. Mommy says they are called ‘children’. I’ve thought about it and thought about it and there are just some things that just don’t make sense to me. I still don’t understand. Now, I think I’ve had enough hands on experience with children to be able to figure a lot of things out. For example, I can run faster than all of the children. In fact, some of the younger ones really can’t even run, they sort of ‘teeter’. 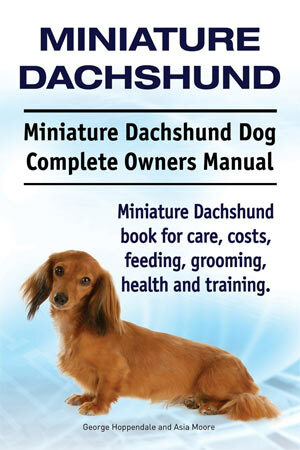 Apparently it takes longer for them to learn how to run than it takes us mini Dachshunds. Children can’t catch a ball very well either. That too, takes a long time for them to learn. And, if you can believe this, children actually seem to enjoy bath time! Go figure that one. I’ve even seen them playing with toys during their bath! To be fair, there are some things we have in common. 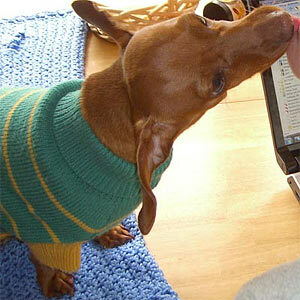 Dachshunds and children both love treats! I’m pretty sure we would all eat treats all day long if Mommy didn’t supervise us. Yup, we definitely would! Dachshunds and children both love to nap. There’s one difference here though. Children seem to get pretty cranky before they take their nap. Dachshunds don’t get cranky before nap time. Oh, yeah, both of us can pretty much nap anywhere, anytime…no problem. Children need help brushing their teeth too, like I do! 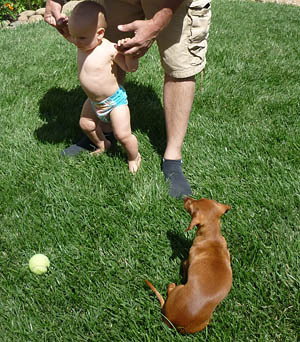 But, most important…Dachshunds and children both love to play!